To enter the giveaway, just leave a comment. I'm putting this up on Twitter and Facebook too, so feel free to enter there as well. I'll pick a random winner tomorrow morning (whenever I post a new bookmark). Good luck! Excited just thinking about it! Well, I don' think you need to apologize, but... I'm in. And I hope you feel better. Really would love to win this one! Oh this is just amazing! I hope I have the luck to win it! Thank you for the opportunity! You don't need to apologize, but I'm glad you are. lol! Thanks for the great giveaway! Thanks for the contest in spite of your being sick! Love this book. Yes, please! Oh wow. Dropping my name in the hat. Wow - dropping my name in the hat. I'd really like this one. Oh, I hope you're feeling better! Just moved into a new home, and this would be a lovely new addition to the bookshelves... Crossing my fingers! And I hope you feel better soon! My husband's favorite; would make a great gift. Wow! What a fantastic opportunity! I do hope you fell better soon! Oh, so beautiful. I'm in! Count me in feel better!! Just looking at a picture of this book makes me happy. Would be pretty cool to own! Get well soon and thank you! Pick me! What an awesome giveaway. Would love the first edition! Hope you feel better soon! What an incredible giveaway. Feel better soon!! Wow - that is tremendous.Thanks for the giveaway! this is my comment. 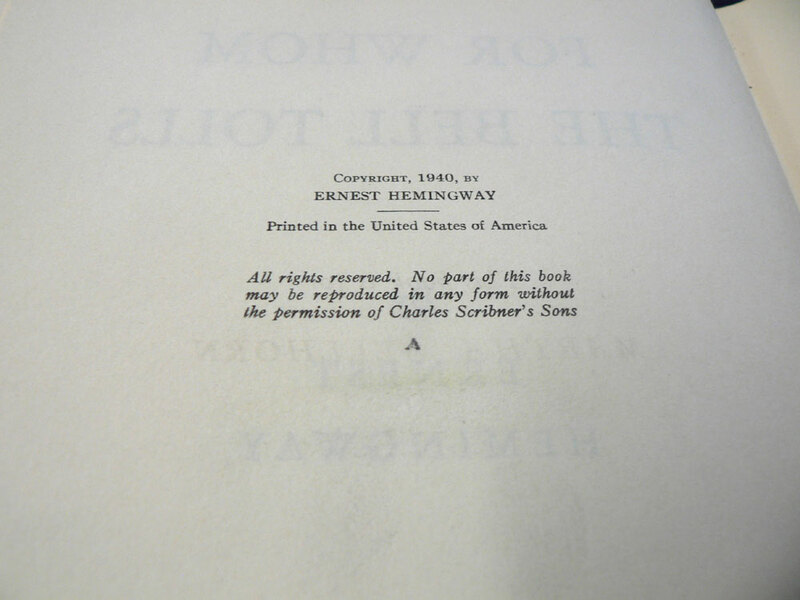 i would love to win this, a first edition of a favorite novel. What a special giveaway! Hope you feel better soon! Everyone gets a sick day, so don't feel bad about. I hope your feeling better. How very generous! Please take care of yourself, and I hope you mend quickly. You are a better person than me :) You get sick and still have an awesome giveaway - it's a tough act to follow! I would love to add this to my collection... and a first ed... that would be great..
i have such a hard time logging on to this hope i win this time..
see?/ I don't see the comment I just left. hope I win this time.. I hope you feel better, and thanks for the giveaway. First Hemingway book I ever read, a classic! ... it tolls for thee! With apologies to John Donne. Just listened to the audio of this book, would love to own this. Count me in. No apologies needed, but thank you for the opportunity! This is incredible and makes my booknerd heart go all aflutter, which is not something I am prone to do, ever. Please pick me! This would be awesome to own, I'd treasure it. And such a nice book. Totally entering. 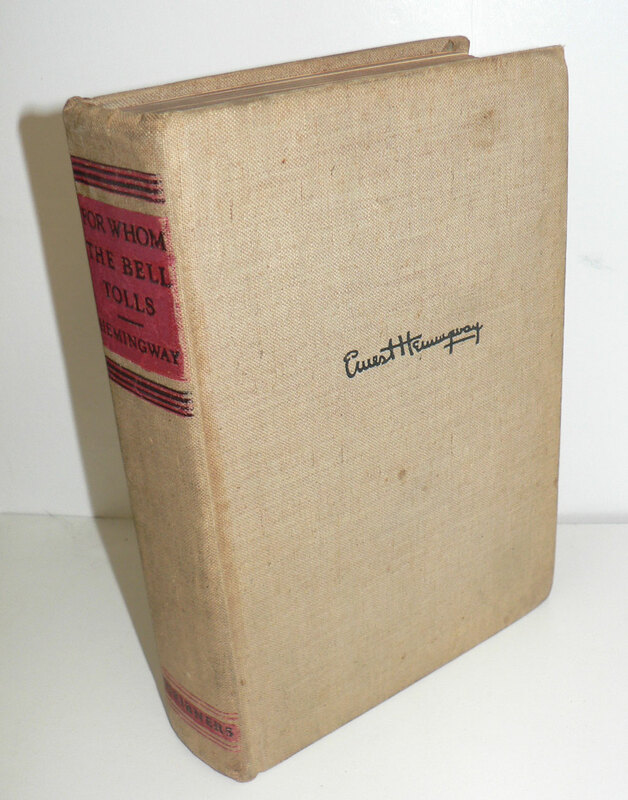 Because I always look askance at Hemingway, but this edition is pretty and COULD CHANGE MY MIND. What a wonderful giveaway. Thank you. Wow! This is an awesome book! what a find! feel better. A very generous apology :) Feel better soon! Oh, my!!! What a treasure!!! Hope you feel better real soon. First, and most importantly, feel better soon! This would be a wonderful gift for a recently retired professor of mine. Please enter me! Definitely want a shot at this. Love Hemingway so much. This may just be one of the best giveaways, ever! Ick. Being sick is the worst. Feel better soon! As for the book, yes, please! You are so good to us and I hope you're feeling better! Thanks for sharing these great finds! You are too good to us and I hope you are feeling better! Came here just to sign up! I hope the bell tolls for me. Hope you feel better. Please enter me. Wow ... I'm in. Get well soon, got the flu here myself! Wow great give away....glad you are feeling better. Feel better! And I'd love to win this--but I'll still follow your wonderful blog if I don't. Great giveaway. Hope you feel better. Ooo, this is wonderful! Just looking at the pictures is great, but of course, having the book would be even better! I like the way you apologize. Glad you're feeling better. It's my favorite book!!! How exciting! I was just about to begin a reread of my tattered old paperback copy!